A pioneer in electric shaver manufacturing, Remington has struggled in recent times to come up with competitive products that would give Panasonic, Braun and Philips Norelco a run for their money. I’ve tested quite a few in the past years and almost all of them have failed to provide a decent shaving experience. Moreover, there were always alternatives from the competition that performed significantly better and oftentimes for less money. 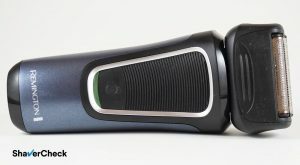 For these reasons, I had very low expectations from the Remington PF7500 Comfort Series Pro, a shaver that promised a lot (in typical Remington fashion). To find out how good it shaves, we subjected it to our usual thorough testing for a period of three weeks. 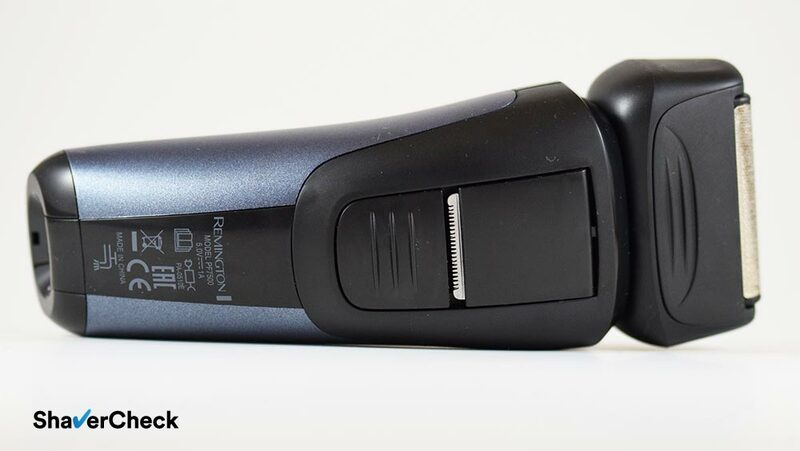 We gathered everything in this comprehensive Remington PF7500 review that documents both the good and the bad parts about this shaver. The PF7500 is a basic, entry-level foil shaver suitable for dry only use. This time Remington went with a conventional setup of the shaving head instead of the oddly designed XF8700 that performed sub-par in our tests. 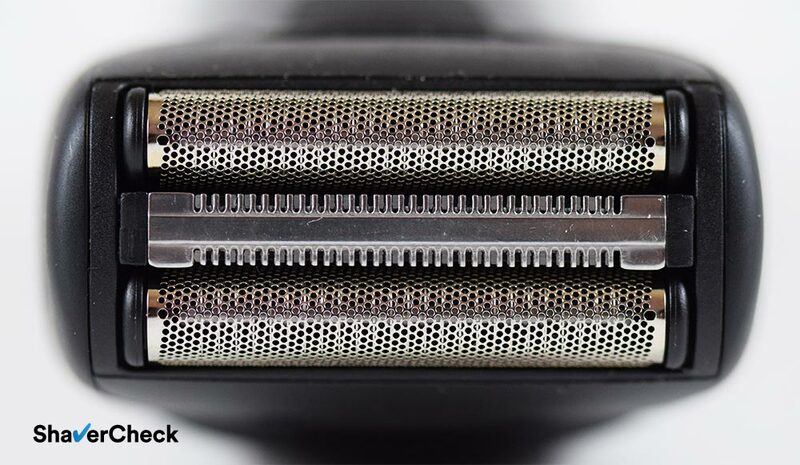 As a result, we have two outer foils that cut the stubble close to the skin, while the middle trimmer catches and cuts longer, flat-lying hairs down to size. The three cutting elements can move independently and the whole shaving head can pivot. 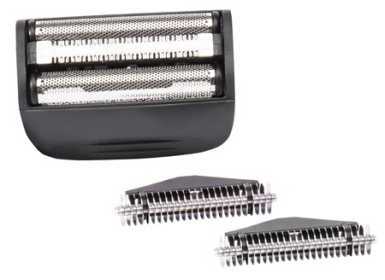 There’s no switch to lock the head in a fixed position like we get with most other shavers. The PF7500 comes equipped with a Li-Ion battery, but it can also be used while it’s charging. Other noteworthy features include a 5-minute quick charge, charging/low battery LED, pop-up trimmer, charging stand. The retail box looks quite nice and all the goodies are neatly packed inside. You won’t experience any wrap rage as Remington decided not to use any heat sealed plastic blisters with this razor. Unfortunately there’s no travel case or pouch. Upon unboxing this PF7500 I could already notice that this was a definite improvement over previous Remington shavers in terms of build quality. The materials used for the charging stand, protective cap and for the shaver itself definitely looked and felt better. The cheap, flimsy plastics were mostly gone. 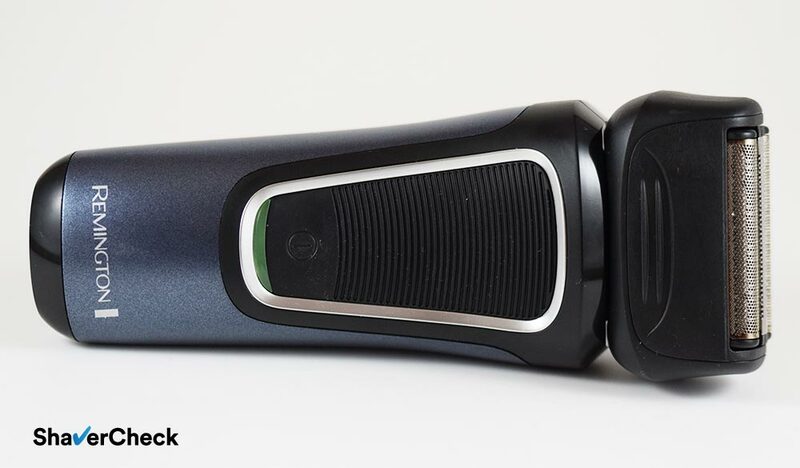 The shaver is entirely made out of plastic and features two treatments: a satin, matte finish and some glossy black around the charging port and on the back. The color scheme is black with a pearly grayish blue. It’s not the most exciting shaver to look at, but it’s not too bad either. I also quite like the pronounced curvature of the shaver when viewed from the side. There are still some uneven gaps and sharp edges, but they’re not as bad as with the XR1340 for example. The matte black plastic on the shaving head looks cheap in comparison to the ones from the more premium brands. The worst thing is in my opinion the very scarce use of grippy materials. There is only one area on the front where your thumb rests that features a textured rubber-like insert. The back of the shavers features a popup trimmer. There are no rubber inserts for extra grip. The rest of the shaver has a smooth and silky finish and it’s therefore very slippery. In fact, I dropped it a couple of times when handling it. Luckily I wasn’t shaving and the shaver fell on my desk from a short distance. But it definitely made me wary of this problem. 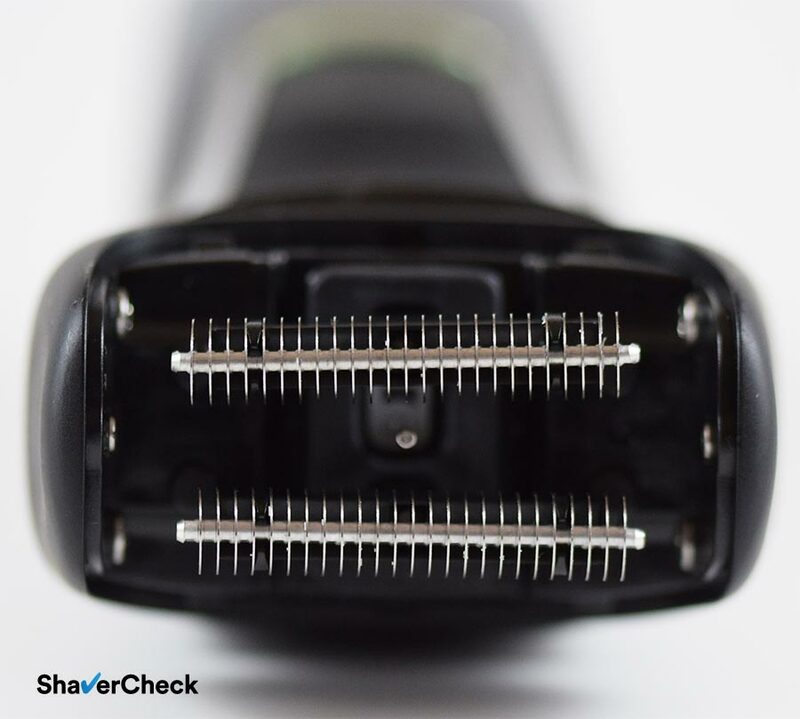 The shaver also has a bulky body with substantial girth; this isn’t normally a problem, but when coupled with a slippery surface it surely doesn’t help. The ON/OFF switch is another potential problem. The implementation makes it prone to breaking with use: there is a hard plastic switch covered by a piece of rubber. And that piece of rubber is very thin and I can clearly feel the hard plastic button through it. I’ve seen this type of damage happening way too often when the switch will poke through the rubber cover. There’s no travel lock either but for this price, I can’t really complain about it. There are other expensive shavers that don’t have one like the Braun Series 7. The protective plastic cap is an improvement over the previous ones, it looks better and is made out of a higher quality plastic. I also like how it allows you to store the shaver in an upright position and the cap also has slots for the water to drain after a thorough cleaning. Overall, the build quality and ergonomics are step up from previous Remington models, but fall short in comparison to other foil razors in this price range from Panasonic or Braun. There are some good parts but also a couple of bad ones regarding the battery and charging of the PF7500. First of all, the battery life seems to be very good; when fully charged, it should provide enough power for 50 minutes of use. You can charge the shaver via the included stand or simply by plugging the cord directly into the shaver. 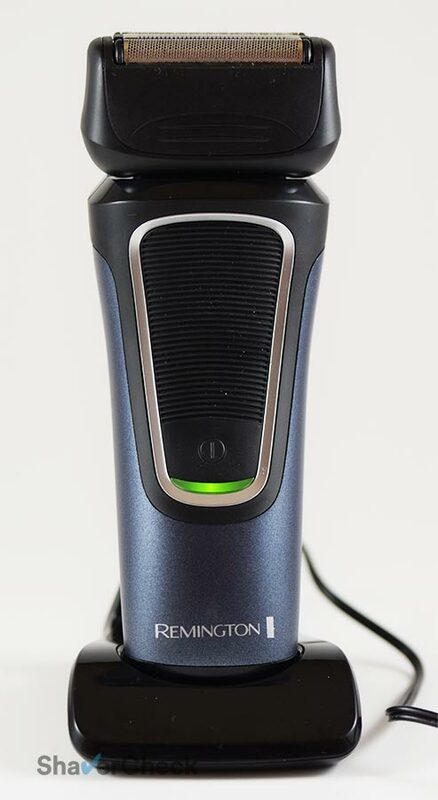 The PF7500 can be used when charging as well since it’s a not a wet/dry shaver. There’s a 5-minute quick charge feature that allows you to have a 3-minute shaving session. Charging the PF7500 directly with the cord. As for the negatives, the charging takes two hours. That’s twice as long as most modern electric shavers require for a full charge. The LED notification light is also as basic as it gets. There’s only one lamp that glows continuously when charging and turns off once the charging is complete. It will signal a low battery by blinking. This isn’t the best solution as it can take you by surprise. For example, the Remington XF8700 displayed the remaining battery in minutes, a much better implementation compared to this. But I guess we can let most of these shortcomings slide since the PF7500 can be used while charging from the mains. Let’s now talk business — the shaving performance. I’ve used the same methodology for testing the Remington PF7500 as on all my other reviews: I used the razor daily and on every other day. I also skipped shaving entirely on weekends just to see how it fares with a two days beard on a hectic Monday. Being a dry only shaver, I used the razor with and without a pre-shave. 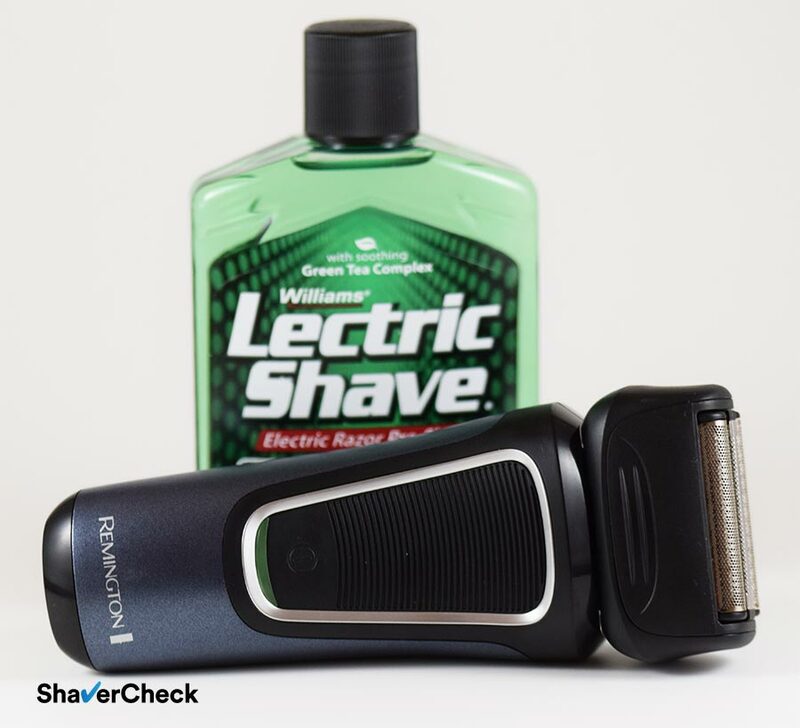 Just for the record, I went with Williams Lectric Shave for this review. So how does the PF7500 shave? Surprisingly well to be honest. In fact, I was expecting another major flop from Remington given my last tests, but it surely wasn’t one. Let’s start with the closeness, which was one of the best I got from a dry shave with any razor in this price category. In fact, I would say that the PF7500 shaves closer than a Braun Series 3 or a Norelco 4100. I would definitely get a five o’clock shadow faster when shaving with any of those. It’s not quite as close as a Panasonic Arc 3 that’s still the closest shaving budget shaver in my opinion, but then again the Remington PF7500 is cheaper. Not to mention the latest LT Arc 3 models that usually cost a lot more, at least at the moment of writing this review. When it comes to comfort, this Remington was again surprisingly good. 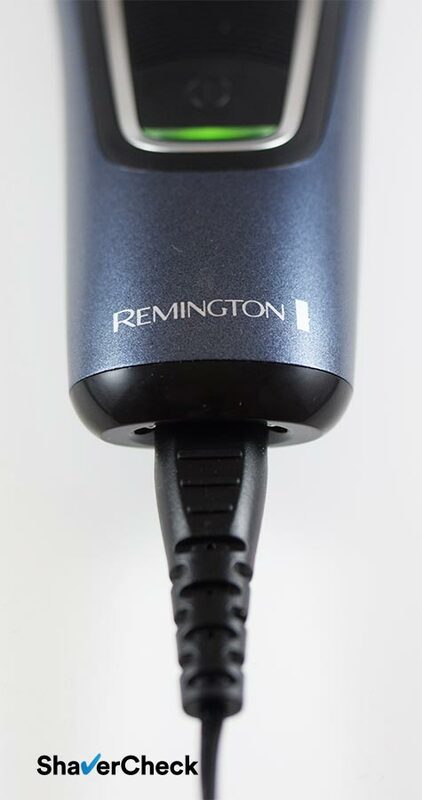 I normally get quite a bit of irritation and discomfort from Remington shavers, but with this one I had no problems apart from a few isolated incidents that were mostly my fault. I didn’t get any noticeable razor burn and the post-shave feel was also good. During my tests the foils of the PF7500 didn’t get hot at all despite an often extended use. I will say that using it along with a pre-shave definitely improved the closeness and the smoothness of the shave, so I highly recommend you to use one as well. What probably baffled me the most was how well it performed with longer hairs. It managed to catch stray hairs on par or better than other entry-level shavers. When I shaved with it after two days of growth I expected at least some pulling on the hairs on my neck, but there was none. And that simple middle trimmer seemed to catch them very efficiently. So far it seems that everything was excellent. Well, not quite. There were definitely some very good parts about how the Remington PF7500 shaves, but it’s not a perfect razor by any means. The thing that bugs me the most is the refinement. The lack of it to be more precise. When shaving, that is when actual hairs are being cut, the PF7500 sounds and feels as if the shaving head is going to disintegrate. It vibrates vigorously and makes a loud rattling noise, especially when shaving longer hairs. My whiskers are particularly thick above my upper lip and on my chin and whenever I shaved those areas I had to use more strokes in order to get a close shave with no rough patches left behind. I also noticed that when I used the razor without a pre-shave the foils would sometimes hop and drag on the skin and the foils can feel a bit rough, especially on the neck. So I would highly recommend using a pre-shave along with it, they’re inexpensive and take seconds to apply. 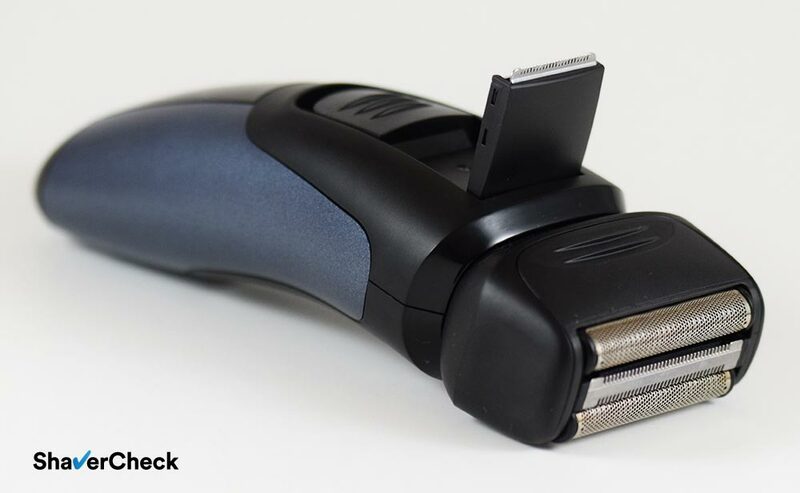 Despite performing far better than I anticipated, the PF7500 is still a basic electric shaver and if you want more power and advanced features you’ll have to spend a lot more money. Finally, the flexing of the shaving head is non-existent. The range of motion is very short and jerky and while the three blades can move independently, it takes way too much force to depress them. But to be honest, the flexing heads on most entry-level foil shavers are pretty bad. 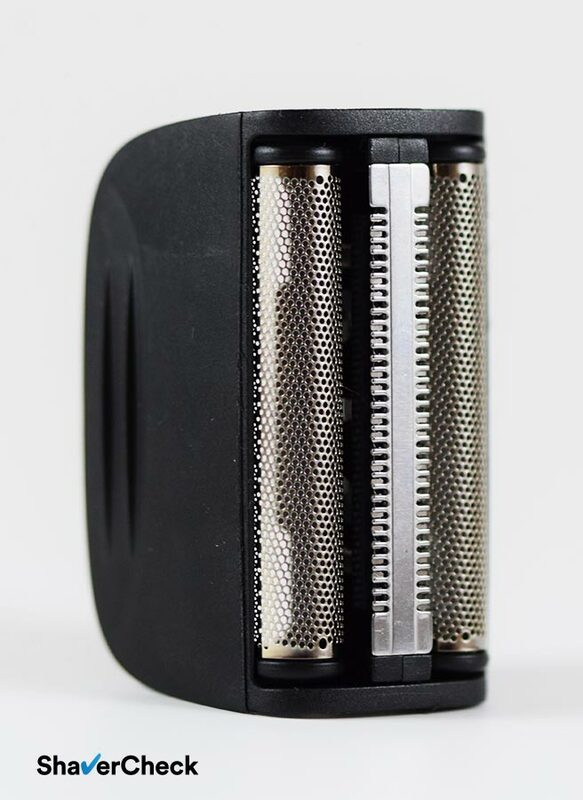 So the PF7500 basically has a fixed shaving head, but this didn’t seem to affect the performance in any noticeable way; I guess if you have very prominent facial features you’ll probably have to put more effort into getting a smooth shave. The popup trimmer is kind of a mixed bag. I’ll start with the good parts and then get to the bad ones. First, it seems to be well above average as far as performance is concerned. Precisely, it cuts the hairs easily with minimal pressure and strokes. The cutters just seem to be sharper than the ones one the Braun Series 3 and 5. My main gripe with those was precisely this as they seemed dull and required more effort to get all the hairs. Second, it doesn’t pinch the skin like other trimmers I’ve tried in the past. Finally, it is adequately wide. I’m absolutely not a fan of very narrow or rounded trimmers. Let’s now talk about the bad parts. And I’ll start off with the one thing that bugs me with pretty much every popup trimmer: the positioning. Because it sits well below the shaving head, you can’t really see what you’re doing. For example, when I’m trimming my sideburns I have to tilt the shaver and get really close to the mirror so I won’t mess them up. Another thing that will annoy you is that the spring that holds the trimmer perpendicular to the shaver when deployed is very weak. In fact, it’s so weak that you must be extra careful not to fold it back in place during an upstroke. It’s the same problem I found on the Remington XR1340. Finally, operating the slider on the back that opens and closes the trimmer is jerky, particularly when you want to close it. I simply stopped using it and I just pushed the trimmer down with my finger. Compared to a Panasonic Arc 4 that also uses a slider to deploy the trimmer, the difference is night and day. The one on the Panny is buttery smooth and consistent. Overall, I would say that the PF7500 is the best Remington I’ve tested by far. Granted, the bar wasn’t set too high, but I must say that it has greatly exceeded my expectations. This is also the first modern Remington I can actually recommend instead of telling you to stay away from it. The lack of an automatic cleaning station is usually no big deal if the shaver is easy to clean manually. The foils and cutters can be taken apart and offer great access to clean them thoroughly. The cleaning process implies popping out the foil frame and tapping it gently on your sink or countertop to remove the bulk of hair clippings. You can use the included brush as well, just make sure not to use it directly on the foils as they can be damaged. Once you removed most of the hairs from the foils and from the inner blades, you can rinse them with warm tap water. I was very careful doing this as the shaver is not waterproof and you can only rinse the shaving head under water, so you’ll have to minimize the risk of moisture getting inside the shaver. Every once in a while I would use a drop of liquid soap on the foils and let it run for a few seconds under tap water for a more thorough cleaning. You should also lubricate the blades regularly, particularly if you use soap to clean them. 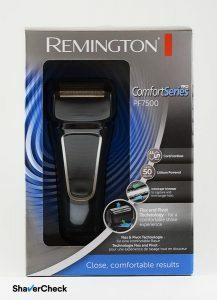 The Remington PF7500 Comfort Series Pro uses the SPF-PF cutters and foil combo. Oddly, Remington doesn’t recommend an interval for replacing them. Based on my previous experience, I would say it’s somewhere between 6 and 12 months. It’s hard to tell after a few weeks if they will last longer than the average blades. The cutters and foil are readily available on sites like Amazon and the price is reasonable. With the PF7500 Comfort Series Pro Remington definitely took a step in the right direction. The razor shaves very well and the price is right too. It still has some drawbacks, but I wouldn’t consider them deal breakers. I tried to reveal all the aspects as objectively as possible so you could decide for yourself if you should buy it. It’s important to keep in mind what the PF7500 actually is: a budget-friendly, dry only electric foil shaver that performs very well at this price point. So if you have a limited budget you should definitely shortlist this one (along with the ones in the next section). As it’s usually the case with basic razors, the Remington PF7500 works best for everyday shaving, but it manages to cope surprisingly well with longer whiskers. I have thick facial hair and it was fine for me to shave with it, so I imagine that for someone with a light to medium beard the PF7500 will be more than adequate. Being a basic shaver that’s easy to use and to clean, it will also be a great choice for a first time user. When recommending other options for a shaver that I’m reviewing I mostly try to suggest products that cost the same or even less, but perform better. Unfortunately for the PF7500 that I tested, the Panasonic ES-RT51-S ticks all the boxes. 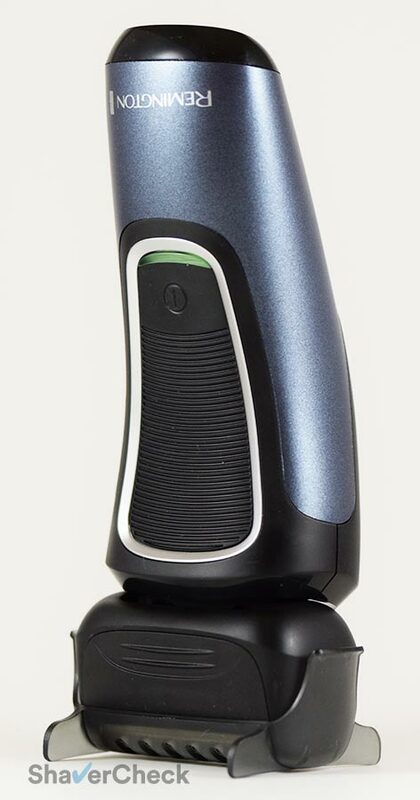 It is the predecessor of the Arc 3 shavers, only that it comes with a straight edge instead of a curved one and has a slightly less powerful motor. All of these are available for roughly the same price. I would personally go for the Panny instead of the Remington, I think it’s a superior shaver in all regards. Also, I’m not too sure about Remington’s reliability in time, but having used Panasonics for years I can honestly say that they’re built like tanks and will take a beating. 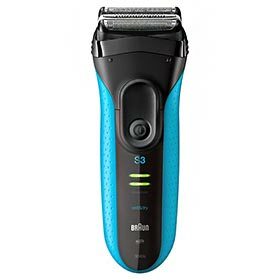 Another shaver that gravitates toward the same price (when you can find it at a discount) is the Braun Series 3 ProSkin 3040s that I reviewed here. While in my experience the PF7500 shaves slightly closer, the Series 3 3040s is more comfortable and more refined and definitely has the better construction. It’s also suitable for wet & dry use and it is completely waterproof. If you have very sensitive skin, the Series 3 would definitely be a more suitable option. I was looking for a reasonably priced razor (it is to be a birthday present to me) and found your review and subsequent comparisons to be most helpful.Many thanks. That’s awesome! I’m glad you found it helpful and I hope you’ll enjoy your new shaver. My uncle has this razor, just recently he attempts to use it and it runs about 10 seconds then shuts down. That clearly sounds like a defective product. If it’s still under warranty, he should send it for a replacement.